THE LAST time Australia suffered a recession, the Soviet Union still existed and the internet did not. An American-led force had just liberated Kuwait, and almost half the world’s current population had not yet been born. Unlike most of its region, Australia was left unscathed by the Asian crash of 1997. Unlike most of the developed world, it shrugged off the global financial crisis, and unlike most commodity-exporting countries, it weathered the resources bust, too. No other rich country has ever managed to grow so steadily for so long (see chart 1). By that measure, at least, Australia boasts the world’s most successful economy. Admittedly, as Guy Debelle of the Reserve Bank of Australia (RBA, the central bank) points out, this title rests on the statistical definition of a recession as two consecutive quarters of decline. Had the 0.5% shrinkage of the fourth quarter of 2008 been spread across half a year, he notes, there would be no record. Yet by other measures, Australia’s economic performance is more remarkable still. 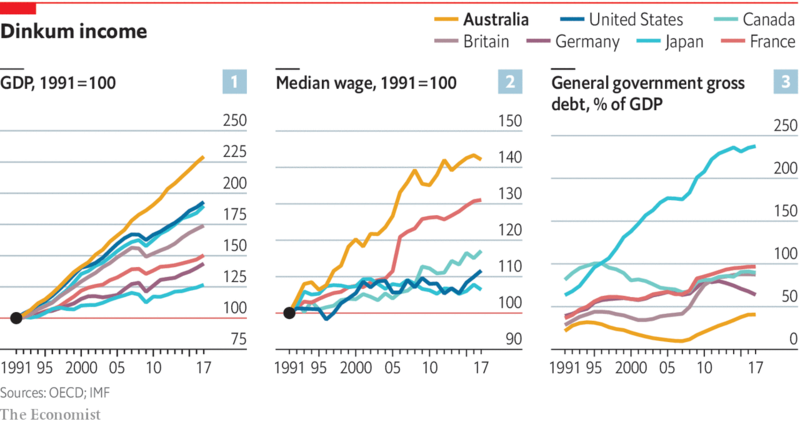 Whereas many other rich countries have seen wages stagnate for decades, Australia’s have grown strongly, albeit less steadily in recent years (see chart 2). In other words, a problem that has agitated policymakers—and voters—around the world, and has been blamed for all manner of political upheaval, from European populism to the election of Donald Trump, scarcely exists in Australia. And that is not the only way in which Australia stands out from its peers. At a time when governments around the world are souring on immigration, and even seeking to send some foreigners home, Australia has been admitting as many as 190,000 newcomers a year—nearly three times as many, relative to population, as America. Over 28% of the population was born in another country, far more than in other rich countries. 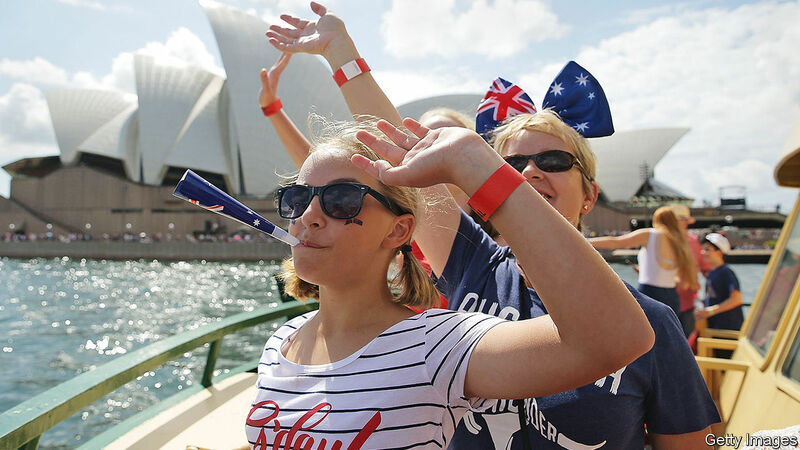 Half of all living Australians were born abroad or are the child of someone who was. In part, this tolerance for outsiders may be a reflection of another remarkable feature of Australian society: the solvency of its welfare state. Complaints about foreign spongers are rare. Public debt amounts to just 41% of GDP (see chart 3)—one of the lowest levels in the rich world. That, in turn, is a function not just of Australia’s enviable record in terms of growth, but also of a history of shrewd policymaking. Nearly 30 years ago, the government of the day overhauled the pension system. Since then workers have been obliged to save for their retirement through private investment funds. The modest public pension covers only those without adequate savings. Australia’s health-care system is also a public-private hybrid. The government provides coverage for all, by paying clinics and hospitals a set fee for every procedure they perform. Those who want more than the most basic service must pay a premium. The government encourages people to take out insurance to cover the gap between the reimbursement it provides practitioners and the rates most of them charge the public. As with pensions, everyone gets looked after, but the government bears only a relatively small proportion of the cost—an arrangement that remains a distant dream in most rich countries. Not all is perfect, of course. A common concern is that the economy relies too heavily on China, which is the biggest buyer of Australian minerals, the biggest source of tourists and foreign students, even the biggest consumer of Australian wine. People worry that if the Chinese economy falters, it will drag Australia’s down with it. Another fear, somewhat at odds with the first, is that China might try to use its economic power to blackmail Australia into weakening its alliance with America. There are glaring domestic problems, too. The appalling circumstances of many Aboriginals are a national embarrassment, and the failure to answer their political grievances compounds the rancour. Even more alarmingly, global warming is making an already gruelling climate harsher. 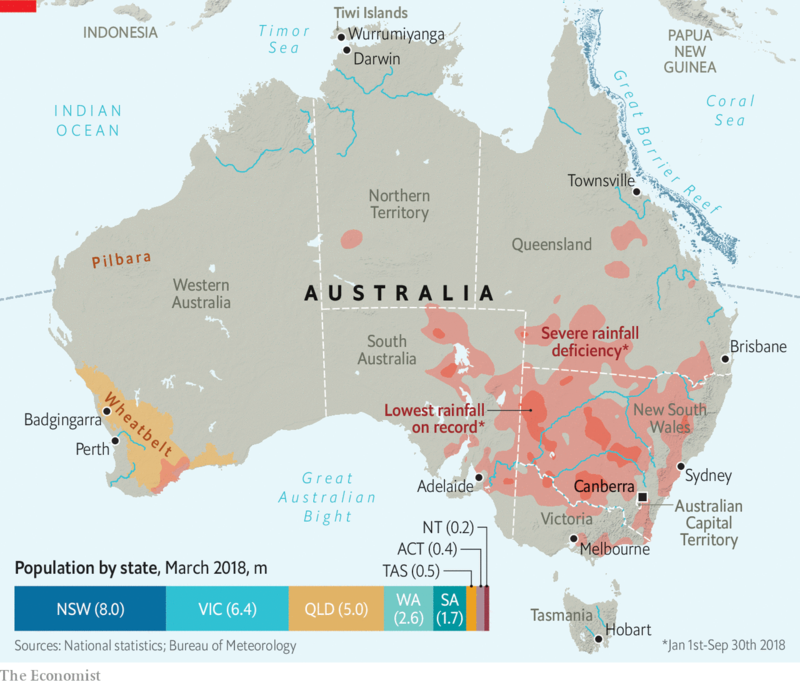 Rainfall, never reliable, is scarcer and more erratic in many farming regions. Over the past two years unusually hot water has killed a third of the coral on the Great Barrier Reef, one of the country’s greatest natural treasures. In theory both the governing Liberal-National coalition (which is right-of-centre) and the main opposition, the left-leaning Labor Party, are committed to cutting emissions of greenhouse gases. But in practice climate change has been the subject of a never-ending political knife-fight, in which any government that attempts to enact meaningful curbs is so pilloried that it either loses the next election or is toppled by a rebellion among its own MPs. Some see the failure to settle on a coherent climate policy as a symptom of a deeper political malaise. Australia used to have long-lived governments. Between 1983 and 2007, just three prime ministers held office (Bob Hawke and Paul Keating of Labor, and John Howard of the Liberals). Yet, since then, the job has changed hands six times. A full term is only three years, but the last time a prime minister survived in office for a whole one was 2004-07. The assassins are usually not voters, but fellow MPs who dispatch their leader in hope of a boost in the polls. As part of the research for this special report, your correspondent interviewed Malcolm Turnbull, the prime minister at the time, who insisted his position was secure. He had been sacked by his fellow Liberals before the interview could be written up. The changes of PM have come so often that Madame Tussauds, a wax museum, has officially given up trying to make statues of the incumbent, who will inevitably have left office before a likeness is ready. The constant revolution is not just fodder for comedians; it also makes consistent policymaking much harder. For those who consider Australia’s unequalled economic performance the result, at least in part, of far-sighted decisions made 30 years ago, the current choppy politics seem like a harbinger of decline. This special report will try to explain Australia’s enviable record, and ask how long its good fortune can last. Is it adopting the reforms needed to keep the economy bounding ahead? Will it have to choose between China and America? Is the current generation of politicians up to the job? Is Australia, in short, as lucky a country as its nickname suggests, or is its current streak coming to an end?